This is one of those nice out-of-the-way spots that not many people have been to. From Sault Ste. Marie, Ontario drive north on highway 17 for 60km. Turn right onto Tribag Mine Road. This is a single-lane road that is a little rough, so depending on your vehicle you may not be able to drive all the way to the falls. In that case just park off the road, making sure other vehicles have lots of room to get by, and walk or bike along the road the rest of the way. Drive down Tribag Mine Road for 6km. Every second kilometre is marked starting with 2. If you get to km 8 you have gone too far. Just after kilometre 6 watch for a parking area on the right side of the road and park there. There is a steep trail, with a black cable for support that starts at the parking area and seems to head toward the river. We went down it, but it didn’t seem to go anywhere. We ended up bushwhacking along the river to the falls, which was beautiful. If you like you can walk up the road to the falls from the parking area. The falls are on a curve to the right, opposite a rock wall that has a creek running down it. The Batchawana Falls are about 15 feet high and produce a surprising amount of mist. We got soaked when we climbed down into the gorge to take a few pictures. 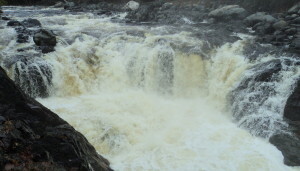 There are also a few other smaller falls further upstream, but I haven’t checked them out yet.